Jewellery storage and presentation Trays, Chain Wraps and Jewellery Cases for displaying Rings, Bangles, Bracelet display, Chain wraps, Earring Cases etc. We have various types of Jewellery Display Tray for use within Window Displays or Shop Counter presentations. Also supplying Travel Carry Cases and Jewellers Wraps for various items of Jewellery Storage uses. Round shape Bangle Display Storage Case in Burgundy finish. 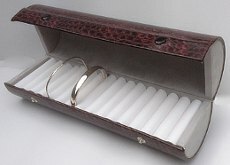 Large cylinder hinged closing Bangle Case to hold 15 Bangles in High Quality finish. Burgundy finish Bangle Display Tray with Grey velveteen trim. Large Bangle Tray 290mm x 220mm x 75mm. Burgundy finish Bracelet Display Tray with 9 sections to hold bracelets for shop window display and jewellers store presentation. Large hinged Jewellery Display Case with lockable latch in Burgundy finish. 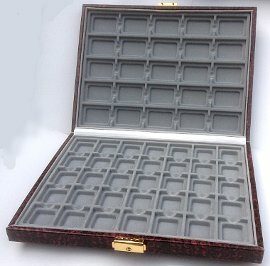 Jewellery Carry Case with 60 sections for stock display or earring pad display. 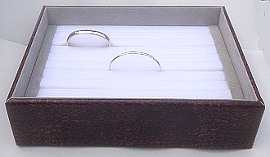 60 x plain Sponge display Pads for 60 section Jewellery Case. 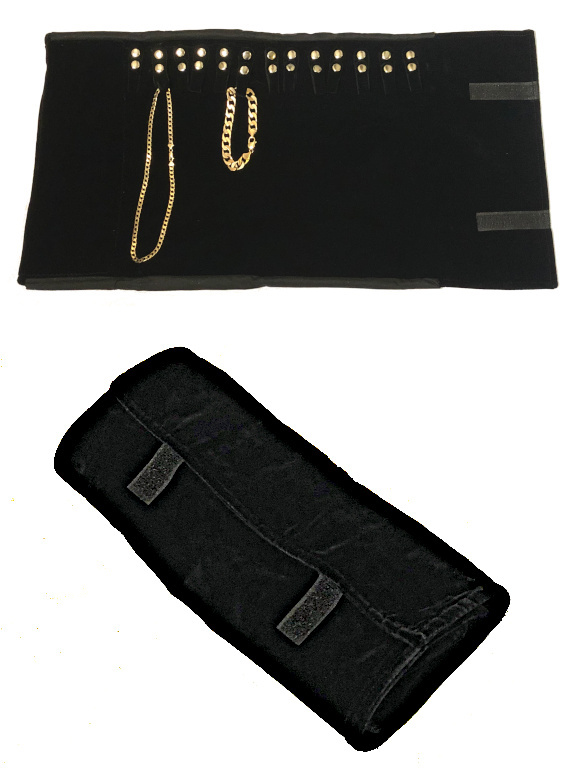 Large Jewellery Roll Soft Chain Wrap approx size 780mm x 280mm with chain securing Clips and secure velcro fastening. Ideal for Travel and Jewellers Samples storage and presentation. 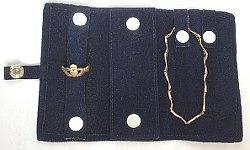 Quality Velveteen Dark Blue Jewellery Storage Roll. Small Button-up velveteen jewellery storage roll including clips , removable storage clips etc. Dimensions approx 150mm size. Quality Roll.